Annette Walker is one of the leading exponents of a new generation of tap dancers taking the stage with grace, style, and above all, rhythm. 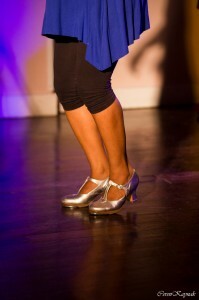 She performs as a freelance hoofer and often collaborates with jazz musicians and bands as well as other tap dancers. Annette enjoys improvising and is queen of the Renegade Stage at the regular London Tap Jam. Annette has performed in numerous cabarets, festivals and special concerts such as Turned on Tap which was at the Queen Elizabeth Hall, Southbank Centre. Annette has also appeared on television with tap group AboutTime. In theatre Annette represented the tap dance character “Master Juba” in the Fittings Multimedia Arts production of Master Juba, The Wonder of the World. In another theatre production, Edmund the Learned Pig, Annette played the role of “Aeriella” which included acting, tap dancing, aerial silks, drumming, singing and basic sign language. In addition to performing, Annette occasionally teaches tap dance workshops.